Situated 2km from the beach with only sand dunes and the forest between us and the coast. Hossegor center, famous for its night life, is a short ride away on one of our courtesy bikes. 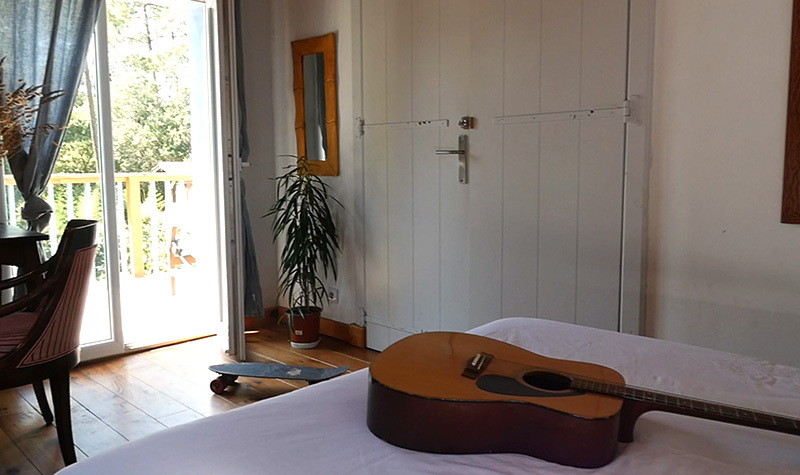 We are ideally positioned to have the best of both worlds (empty waves and a good nights sleep in the quiet side of Hossegor). The camp consists of two purpose built surf houses. A five bedroomed two storey house with three dorm rooms,one private double and a family room with a balcony. The second house at the opposite end of the property is a three bedroom bungalow with its own kitchen, bathroom, lounge and amenities. There are two private doubles rooms and a family room. We have a large private garden between the two houses with access to all the usual facilities. Playstation - Only if it's raining! The Dorm rooms are 6.5m x 4.5m with high ceilings and are equipped with 4 - 6 beds in each. Duvets, pillows, towels and linen are all provided. There are three private double rooms. One in the main house and two in the bungalow. Ther are two family rooms, each one suitable for up to 5 people per room.